It looks like viewers are ready to check out a new Fox animated series created by somebody other than Seth MacFarlane — but aren’t too excited about The Cape. 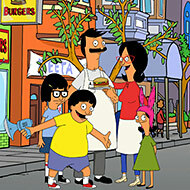 Sunday’s debut of the offbeat Bob’s Burgers got off to a very strong start in the ratings, drawing 9.5 million viewers and notching a big 4.5 rating among adults under 50. The latter number makes Bob’s the biggest debut of any new show this season with the younger demo. There’s a big asterisk attached to the Bob’s bow, however: All of Fox’s prime time was boosted by a huge NFL playoffs overrun. The Simpsons, for example, earned a 5.7 in the under 50 demo, and at 9 p.m., Family Guy did a 4.7. Still, Bob’s held on to about 80 percent of its Simpsons lead-in, which is a bit better than The Cleveland Show had been doing at 8:30 p.m. If it can keep holding on to that much of its lead-in’s audience, look for Bob’s to be back next season. The news wasn’t so great for The Cape, however. Finally, Showtime got some good news Sunday with the premiere of new William H. Macy drama Shameless. It averaged about one million viewers in its 9 p.m. time slot, making it the biggest Showtime drama series premiere since the 2004 bow of Dead Like Me. Earlier in the night, Californication began its new season with 850,000 viewers (its best season premiere ever), while Matt LeBlanc’s new comedy Episodes did okay-but-not-amazing with 768,000 viewers.